If you own a commercial business, one of the most pressing thoughts on your mind is how to secure your workplace. After all, you’ve worked hard to make your business into what it is today, and you wouldn’t want a break-in or illicit entry to disrupt that hard work. When you’re looking to add an extra level of security to your business, don’t jump immediately to costly security cameras and motions sensors. Instead, start with something as simple as the locks on the doors. Firstline Locksmith has been working with commercial businesses for over 25 years. In that time, we’ve worked with nearly every kind of commercial door lock available. 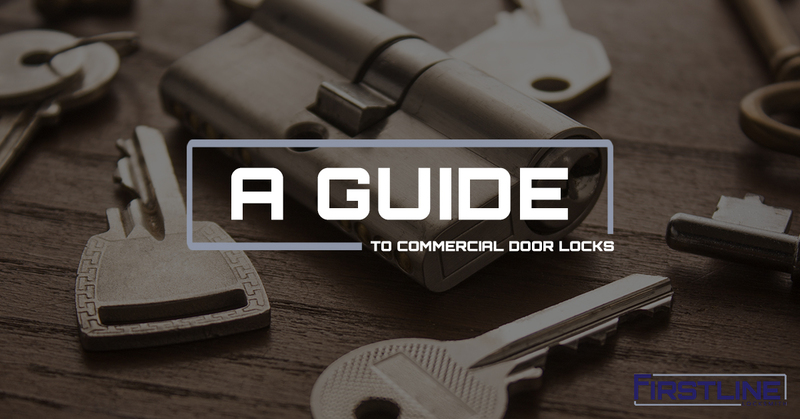 If you’re looking to have new commercial door locks installed or replaced at your New Jersey business, be sure to consult our handy guide. The first step in choosing a new commercial door lock is working your way through the dizzying array of locks that are available to you as a business owner. From plain padlocks to high tech digital locks, there’s a lock to meet every need. While we as professional locksmiths may enjoy waxing rhapsodic about the virtues of locks all day, we understand that not everyone might feel the same. To make selecting the right lock for your business easier, Firstline Locksmith will walk you through some of the most common commercial door lock options. The mortise lock is a popular choice amongst business owners because of its durability and reliability. They’ve proven to be a lasting design, and have been in use for decades. Their durability also makes them ideal for businesses that see a lot of traffic come and go through its doors. A mortise lock is capable of standing up to the near constant use that any commercial business experiences. The key to its durability rests in the design of the lock. The deadbolts of the mortise lock are actually housed within the body of the lock itself. This makes it harder to access without the assistance of a skilled locksmith and makes it more resistant to forced entry. In general, the components of the mortise lock are stronger and designed to handle regular use and unexpected abuse. The crash bar, or push lock, has been a popular choice for commercial businesses because of their ease of use. They can be pushed open with a hand, shoulder, or hip, and allow for rapid egress from a space if necessary. Unlike many other commercial door locks, many crash bars are essentially keyless. People can exit a space using a crash bar without engaging any cylinder or rotary motion in the bar itself. Instead, the bar is connected to the latch that keeps the door locked in place. Pressing the bar retracts the latch and allows for the door to swing open. Typically, these doors can not be opened from the outside without the addition of a lever. Crash bars are typically installed to aid in emergency evacuations. Often, they are placed in areas that have specific fire code requirements. The deadbolt has existed for centuries and still remains one of the best ways to secure a door. Deadbolts are commonly found on doors that lead in and out of a business. Their design makes them ideal for securing a door from forced entries. Deadbolts can be locked from inside and outside of the building for ease of use and added security. To better secure a business, many deadbolt systems utilize a larger door security system. A steel door frame and a deadbolt made from a hardened steel alloy ensure that the door and deadbolt can withstand even the most violent attempts at entry. Padlocks are ideal for businesses that have many spaces to secure. Cabinets, trailers, and storage spaces need a lock that is easy to manipulate and can be reused on other spaces. The wide range of sizes and styles of padlocks make them an obvious choice for many business owners. Padlocks can be secured with a combination or key, or both for added security measures. New padlocks even have “shoulder shackles” that can keep bolt cutters from cutting through the lock. Often, padlocks can be custom made by a locksmith so you have a tailored commercial door lock solution for your business. Firstline Locksmith has worked extensively with businesses, and in particular, retail businesses. We understand the need to keep your workplace and its products safe and secure. Our locksmiths are trained regularly to stay on top of the latest advancements and innovations in locksmithing services and technologies. With New Jersey’s preferred locksmith working on your commercial door locks, you’ll always know that your business is well taken care of. Schedule your locksmith services today.